If you're looking for fun Halloween printables, look no further than our cute witch coloring pages. Whether you're looking for a printable that's more sweet than scary, or a witch that's a little bit scary for some Halloween fun, these free coloring sheets are a great way for kids to get creative around this fall holiday! 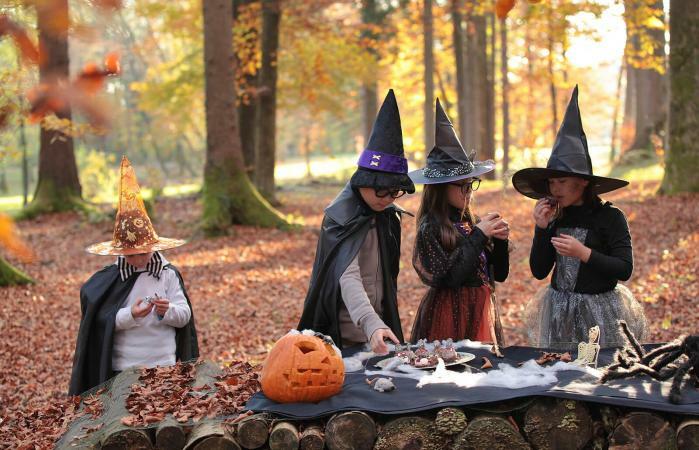 Kids of all ages can enjoy coloring witches. Whether it's with crayons, markers, or colored pencils, they can get add their own special touches to the witches and backgrounds. If you need help downloading the printable, check out these helpful tips. This friendly witch on her broomstick is the perfect activity for preschoolers and others who might be scared off by more menacing images. This coloring page of a sweet little witch riding her broomstick across the night sky is super cute. It is a perfect page for little kids looking to decorate for Halloween. This coloring sheet is ideal for kids who want a cute witch page with a touch of Halloween spookiness. The witch's smile and crooked hat are sweet and fun, but what's she stirring into her witchy cauldron? In addition to being used as a coloring sheet, this one could also be the inspiration for a Halloween writing prompt, journal entry, or creative witch story. 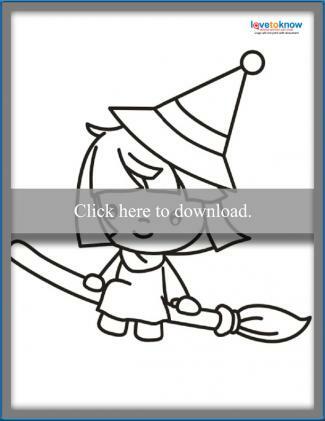 Download this smiling witch with her cauldron to color. This adorable witch will also be a hit with kids of multiple ages. Her cool and crazy hair, unique witch outfit, and slightly scary cat companion all make her unique. Invite kids to decorate her hat, outfit, and the web with different elements - encourage them to go beyond traditional Halloween motifs and tap into their creativity. 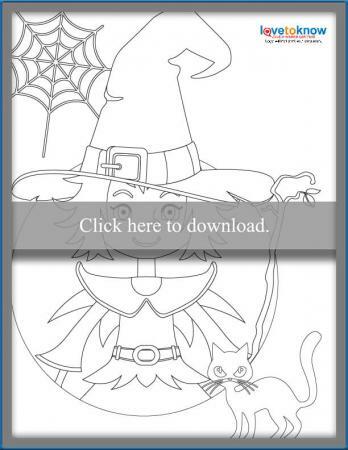 Download this cute witch and cat coloring page. If you're looking for a fun but just a little scarier take on the popular Halloween witch idea, is this witch face printable will fit the bill. Along with the bats and broom, it's a classic Halloween witch kids will love to color. Download this scary witch face printable. Witches aren't the only creatures that lurk in the night on All Hallows' Eve, there is an assortment of ghouls. Therefore, explore these other coloring pages of Halloween characters kids might like. This cute, friendly little Frankenstein makes a great partner for our sweet witch. His friendly demeanor and smile will work great for little kids. Halloween is nothing without haunted houses. Whether you frame it or just print it for your kids to color on a rainy night, this will make a great addition to your haunted motif. Two for the price of one. This mummy printable offers you two different printables for your kiddos. You can print out a fun cat mummy that is guaranteed to make you smile or a silly mummy coming up from the ground. Whatever, you choose, the kids will be happy. Halloween isn't over until you've overindulged on candy. Let this candy corn coloring page help to get you started. Now that your kid has colored a cute little witch for you, what do you do with it? Well, instead of letting it sit on the fridge for a few weeks or throwing it in the trash, try making some fun Halloween decorations from it. Whether just one kid or a whole class made witch coloring pages, you can make a candy bag out of it. All you need is a paper bag and a little tape. Simply take the coloring page and adhere it to the paper page. Viola, you have a witch trick or treating bag. You can make it sleeker by cutting your witch out and coloring the bag like the night sky. 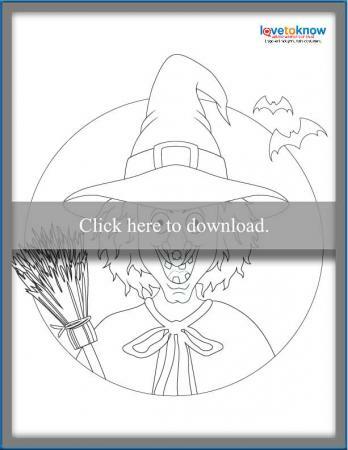 Take your witch coloring page and either laminate or frame it to make into a Halloween decoration. Rather than spend money buying them at a store, you can laminate your cute witch and add her to your window or adhere her to your door. 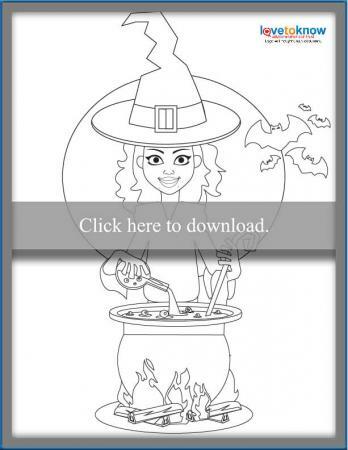 You can use the witch coloring page to make larger poster art for Halloween. This can be put on a projector and made larger for kids in a group coloring project. Fun, friendly witch coloring pages can be fun for all ages. Not only will kids really enjoy them, but they can make fun Halloween decorations.